"Biowave DNA Life Science UV/Vis Spectrophotometer"
Fleible data export optional accessories include Export to PC software, built in printer or SD card Method/Data storage. The Biowave DNA uses novel optics that does not need a lid, for high energy xenon light source covers the range 190-900nm, has a long lamp lifetime. Simple selection software and large graphical display provides for ease of use and data interpretation. 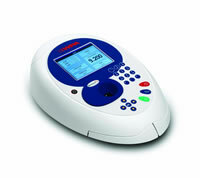 This instrument has a 2 year warranty and the Xenon lamp has a 3 year warranty. The stored methods include DNA, RNA and oligonucleotide calculations, protein assays such as direct UV measurement, BCA, Biuret, Bradford and Lowry and cell density measurement. Unlike many dedicated life science instruments, the Biowave DNA can also measure Absorbance or concentration at any wavelength so there is complete flexibility for future applications. For added convenience it is possible to display a scan of the nucleic acid profile which is particularly useful for RNA samples where impurities may be present in the 230 nm region, yet not have an adverse effect on the 260/280 Absorbance ratio. The system is compatible with both Quartz and disposable low volume UV cuvettes. The instrument can be used as a stand alone or results may be exported. Results can be printed directly using an (optional) integrated high quality graphical printer for a permanent record. Export options include via a USB connection to a suitable PC running Print Via Computer (PVC) software (included) for advanced reporting and data storage. Alternatively the SD card accessory (optional) allows laboratories to export to standard SD or SDHC memory cards. This will be particularly useful to laboratories wishing to clone methods and folders between instruments. Only one optional accessory can be fitted to each instrument.